Dirt has a bad reputation. The word “dirt” finds its way into our phrases that often describe terrible things such as “dirt bag”, “getting all the dirt”, “dirt cheap” “dirt old” or “dirt poor”. We despise it when it invades our homes, cars and belongings and leaves tracks or layers of dust. Dirt and soil is dug up, burned, dumped and stomped on every day but people don’t stop and think about the importance of soil in their everyday life. It is the reason why plants thrive, why our homes and buildings are able to have a foundation to build on, and it traces our history from millions of years of rock sediments deposited in layers underground that record changes of the Earth’s surface and our ancestors. Soil is the foundation, literally, for plants to thrive on. Soil supports an array of ecosystems, such as forests, jungles, and prairies and helps with biodiversity. Plants provide nutrition, medicine, materials for clothing, products and building to society. While it helps with biodiversity in plants, it also supports animal biodiversity under and above ground. From microorganisms to insects to large-sized animals, soil helps maintain the health of the environment by interacting with air and water in their natural cycles and by providing nutrients to plants, which in turn provides nutrition to animals. Soil is also beneficial to water. Soil absorbs water for plants to use, which in turn are an important part of the water cycle that recycles water in our atmosphere. Soil also affects the way streams, rivers and bodies of water flow and hold water. Soil also helps reduce pollutants in water due to its absorption properties. Soil is the foundation and base material for building, which we talk more about further down, and infrastructure. Without soil, we wouldn’t have a solid foundation to build on. It is the historical account of the planet’s past by containing and maintaining evidence from both ancient natural and human development that help us learn about our planet’s story. Finally, soil can help us understand the effects of climate change. Due to soil being the source of fossil fuels and organic matter that releases carbon, we can draw a map of how we can reduce greenhouse gas emissions to create a safer and healthier world. There is a significant difference between the two although at first glance they look the same. Soil is made of decaying organic matter, microorganisms, and insects that create a living environment where nutrients, water and air are exchanged. Dirt is basically dead, lifeless soil. It is the sediment, small particles, that have eroded from rock over thousands of years. You can add organic matter, insects and microorganisms to dirt to turn it into soil. Also, dirt is small particles of soil that have been displaced by the wind and collects as dust in your home and on your belongings. It is rare for dirt to avoid mixing with insects, organic decaying matter and microorganisms so most areas are made of soil. First you have to understand the soil properties of your area. Some areas deal with sandy soil that accumulates into dust easily. Others deal with clay soil that hardens and causes the soil to become impervious to water. Other areas once used to be thriving wetlands and are likely to sink if construction is not done properly. Clay is highly beneficial to keeping your plants hydrated due to its ability to hold water. It is also high in nutrients, which makes it essential to your soil. Even though it has its benefits, clay can be a nuisance when it gets stuck to your shoes. Also, when looked at microscopically, clay is made of tiny particles that allow little air space. Due to this reason, water drains slowly through clay and clay takes longer time to warm up in the spring and summer. When clay dries, it can turn your yard into a small desert due to cracking soil. Sand is completely different from clay due to its large particles that allow an abundance of air space. For this reason, water drains through sand quickly and heats up relatively fast. Due to its ability to warm up faster, planting can begin sooner in the spring but it can dry out quickly in the summer and it doesn’t hold nutrients as effectively as clay. Out of the three soils, silt meets every soil in the middle. The particles in this type of soil are medium-sized and can hold more nutrients than sand but not as much as clay. Same goes for its heating capabilities, it meets in the middle between all three, which is perfect for the gardener. All soils are mainly compose of these three type and whichever soil type is more prominent that will dictate the properties of your soil. Ideally, you want 20 percent clay and the rest equal parts of sand and silt, which is named loam. The best of all three worlds are in loam with its great water drainage, aeration of soil, moisture retention and fertility. Here is where we harness our scientific method powers and process of deduction and elimination. Basically, we are testing your soil out. There are multiple ways to test your soil. Here we have outlined two tests that can help you determine what soil type you have. Moistened an area of soil then let it air dry for a day. The following day, grab a chunk and squeeze it firmly in your hand. If the ball remains right and is slippery, then the soil is mainly made of clay. If your soil instead can’t hold its shape, easily crumbles and gritty, then you’re holding sandy soil. Lastly, if the soil remains in a loose ball and it slightly crumbles then you have loam, which is a combination of all three and the ideal soil for gardening. Dry soil out on a flat surface until it can break easily into crumbs. 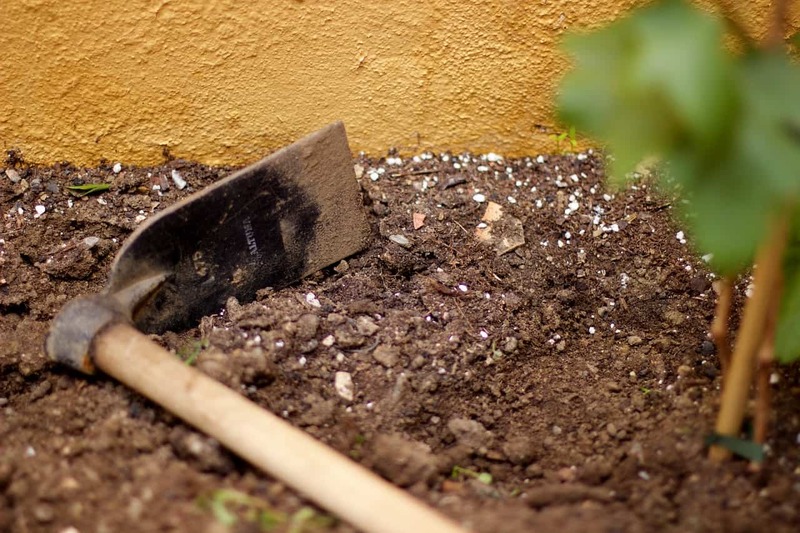 Pick out any remaining debris, such as roots, pebbles, insects, and then crush the soil with mortar into a powder. Lay a layer an inch thick at the bottom of a clear glass jar that is quart sized. Fill the jar with water only two thirds up and add a dash of salt (can substitute for a teaspoon of liquid detergent). Shake vigorously to make the soil particles separate. Once separated, let the mixture settle into different layers. After about a minute, the particles of sand will settle into the bottom. Then, after a couple of hours, the silt particles will settle next. There will be a visual difference between the two layers. Silt will have smaller particles than sand. Once the layers have completely settled, get a ruler and measure the total amount and each individual layer. Here we must do some math. Convert your measurements to percentages. For example, if the entire soil sample is one inch long and your sand layer is ½ an inch long then your soil is 50 percent sand. Next, if your layer of silt is ¼ inch then your soil is 25 percent silt and the rest is 25 percent clay. Now, how do you work with your soil? Working with Clay – Addition or lack of water affects the way this soil swells. When wet, clay tends to swell and is easily molded and shifted. Because it swells, this can cause concrete foundations to move and crack. When dry, clay shrinks and tends to crack. This movement can cause the foundation of any construction project to shift with the ground’s movement. Fill or sandy loam – Loam, as mentioned above, is a combination of silt, sand and clay that holds the best of all three worlds. This type of soil shows little effect to the presence of water due to its balanced ability to hold and drain water. Sand – Usually sand is combined with other materials and it doesn’t shift when moisture is present due to its inability to hold water. However, sand can erode if drainage does allow water to flow under the foundation. Sand can also slip into cracks created by soil and can cause the foundation to move horizontally or leave gaps under the foundation. Although, you can solve this by using helical piers for foundations supported by sand. Rock – If not properly fastened with anchors in areas with a slope, rock fractures or faults can cause the foundation of your project to slide and fall. When leveled, bedrocks such as limestone and sandstone have great high bearing capabilities to support buildings and homes. Fine Versus Granular Soils: Silts and clay is made of fine soil that are dust and micron-type particles. Granular soil looks more like small stones and can be a blend of gravel, sand and other particles. Granular soil is stronger than fine soil and fine soil is highly affected by water and changes size due to its presence, which makes it not the best for foundations in a construction project. In this instance, you may consider adding an aggregate to the soil to increase its retention and particle size. After learning more about your soil type, think about what kind of project you would like to do and how that soil may affect it. Are you building a home and you need a good foundation or driveway and walkway on clay soil that may crack your project in the future? Are you trying to bring more life to your garden in a dry, sandy soil? Are you trying to stabilize the ground during in your shed, stable, front or backyard in a slippery, clay soil? Gardens: Loam is the best soil for plants to thrive in due to its ability to offer the best of all worlds in one. Depending on your area, you may have different needs for the structure of your garden. In drought-prone areas, such as California, you will need to consider using plants that naturally retain more moisture or adding moisture retaining soil for your plants to thrive through droughts. Stables: Consider what kind of soil is used as the ground. If it’s a material that tends to get muddy when wet, consider stabilizing the ground with some permeable pavers. Walkways/Driveways: In case you are building a walkway or driveway, adding impermeable pavement to an area mainly made of clay soil will cause your property to be more at risk of flooding. Consider changing the soil or creating a detention area or drainage system underneath to direct the flow of water away from your property. Parking lot: When building parking lots, the more you add impermeable pavement, the more likely it is required for your team to install a detention pond. Understand how the soil works and consider using permeable pavement to work with the environment.